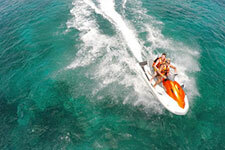 Speed across the Caribbean Sea and feel your heart racing when you rent a jet ski at Playa Mia. Soak in the island scenery and jump the waves on an exhilarating cruise where you're the captain. No experience is necessary to rent a jet ski at Playa Mia - just a bold spirit and a craving for thrills and adventures. Also known as wave runners, these personal watercraft are a great way to enjoy the island - and it's no surprise that the watersport is one of the most popular things to do in Cozumel. Each jet ski fits one or two adults and is easily maneuvered with the handle controls. Speed up, slow down, race towards the horizon - pilot your own watercraft and discover the freedom of the sea. Jump the waves and wipe out just for fun - or keep it calm and relaxing, on a slow ride near the shore. Rentals of wave runners are just one of the add-on activities that you'll find at Playa Mia Grand Beach and Water Park. You can also upgrade your island experience to include a snorkel tour, fish spa, lunch buffet, open bar, and more. And of course, you'll have access to twenty amazing attractions that are included in the cost of admission. From our floating challenge track to the swim-up bar, the water slides to the underwater Mayan city, the fun never ends at our blissful beach park. Do you feel the need for speed? Book your Playa Mia adventure and add on a jet ski rental today. Please contact us for more information!